"Why Do I Have to Confess My Sins to a Priest; What Makes A "Good" Confession?" "Why Do I Have to Confess My Sins to A Priest?" On the first Easter, Jesus told His apostles, whom He had ordained as priests a few days earlier, that just as God the Father had sent Him, so He was sending them. He breathed on them the power of the Holy Spirit, giving them God’s power to forgive sins, since no one can forgive sins but God alone. He told them that whatever sins they forgive are forgiven and whatever sins they retain are retained (Jn 20:21-23; Mk 2:7). Since the apostles were unable to read minds, the only way that they would know which sins to forgive and which to retain is if people told them their sins. 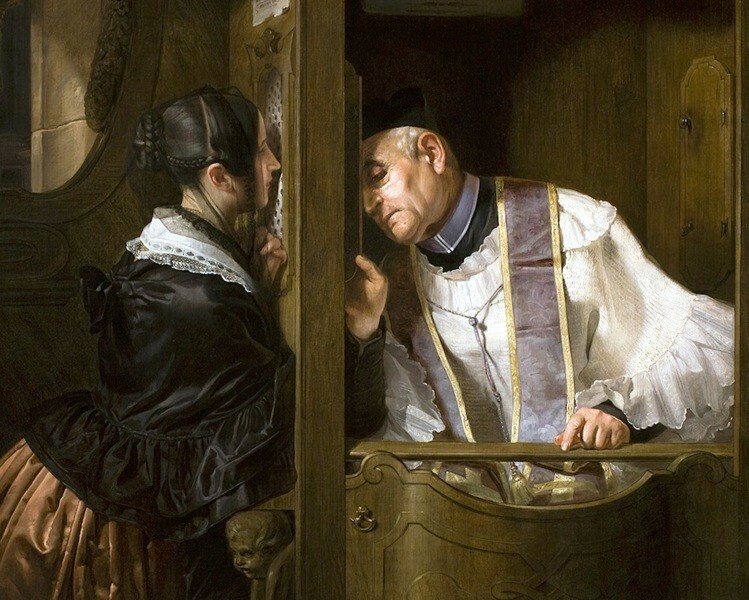 Jesus thus established the essential structure of the Sacrament of Confession. Just as He uses priests to give us His Body and Blood at Mass, so He uses them to give us His mercy in Penance. The Sacrament consists of three actions on the part of the penitent: 1) Contrition (sorrow for one’s sins); 2) Confession (telling one’s sins to the priest; and 3) Penance (a desire, shown by some action given to us by the priest, to make up for one’s sins and amend one’s life). Together, these three actions are called the “acts of the penitent.” Before going to Confession, it is important to first ask God for help in prayerfully examining one’s actions in the light of Christ’s teaching and example. Some review their behavior by the Ten Commandments, others by Christ’s command to love God and love others, others by their correspondence to the beatitudes, others by comparing their behavior to the most important Christian virtues, and others by the seven “capital” sins (pride, envy, anger, sloth, greed, lust and gluttony). It is not enough merely to focus on how one has broken God’s “rules,” but rather how one has damaged his relationship with God and others and hurt himself interiorly. Sin is an offense against God that ruptures our communion with Him and with His Church (CCC 1440). It is far more than “breaking the rules,” but, much more importantly, is a failure to love God and to love others, which causes real damage in all our relationships. Archbishop Sheen used to say that “sin is hurting the One we love…” There are sins totally incompatible with love for God and others (mortal sins, in which genuine love is “dead”), and ones in which love is less grievously wounded (venial or “easily forgiven”). A mortal sin involves 1) an action whose object is grave matter that is committed with 2) full knowledge and 3) deliberate consent. Grave matter is generally understood to be something that violates the Ten Commandments. Full knowledge means that one is aware that God or the Church He founded considers the act sinful (even if one doesn’t totally understand why it is sinful). Deliberate consent means sufficiently intentional to be a personal choice (CCC 1857-1859). A mortal sin “results in the loss of charity and the privation of sanctifying grace; that is, of the state of grace. If it is not redeemed by repentance and God’s forgiveness, it causes exclusion from Christ’s kingdom and the eternal death of Hell, for our freedom has the power to make choices for ever, with no turning back” (CCC 1861). This is why it is so important for mortal sins to be confessed to a priest as soon as possible (CIC 988) and before receiving any of the other Sacraments. Jesus, the Lamb of God who came to take away the sins of the world, said “Repent, for the kingdom of God is at hand” (Mt 4:17). He healed people both physically and spiritually by forgiving their sins. He taught us to pray to the Father to forgive us our sins and to bring us to forgive the relatively smaller debts of those who sin against us (Mt 6:12; 18:21-35). On the Cross, as He prepared to die to take away the punishment due to us for our sins, he prayed: “Father, forgive them, for they do not know what they are doing.” After His resurrection, not only did Jesus give the apostles the ability to forgive sins in His name, but He also commanded them to preach “repentance and forgiveness of sins” to all nations (Jn 20:21-23; Lk 24:47). That’s what the Church continues through preaching the need for repentance and making Jesus’ mercy available through the Sacrament of Penance. Should I go to confession if I haven’t committed any sins since my last confession? No, you should stay at home and wait for your canonization papers to arrive! Seriously, if it’s been several weeks since your last confession and you think you haven’t committed any sins, you have probably not examined your conscience very carefully. “The just man,” the Book of Proverbs tells us, “falls seven times a day” (Prov. 24:16). If you’re struggling to find matter to confess, examine your conscience for sins of omission (James 4:17 declares, "Anyone, then, who knows the good he ought to do and doesn't do it, sins. "), or think about the seven capital sins, or just meditate on whether you in fact have shown that you love the Lord with “your whole heart, mind, soul and strength” (Lk 10:27). Although having venial sins will not keep us from receiving Holy Communion, it is important to go to the Sacrament to confess them. Through the Sacrament, we are not only forgiven our sins, but we also receive God’s grace to fight against temptation. The great saints, who were filled with love of God and seemed for the most part to have avoided mortal sins, confessed very frequently, because the Sacrament helped them grow in God’s grace. Confession reveals to us our need for God’s help in the “little things” of the day and leads us to ask for that help. Remember, in the Sacrament you are fundamentally talking to God through the priest. God loves you, wishes to forgive you, and desires to embrace you with the joy with which the prodigal son was embraced in Jesus’ parable (Lk 15:11-32). Moreover, know that you will not say anything that the priest has not heard before. If you feel nervous or uncomfortable, share that with the priest and he will help you to overcome that and to help you make a “good” Confession.